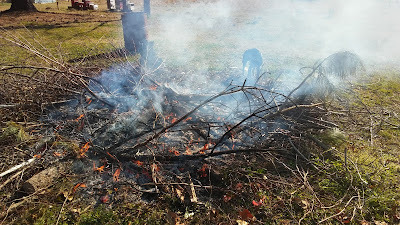 After three freezing nights, this morning Adam got up and, noting the stillness in the air, started a big burn pile. 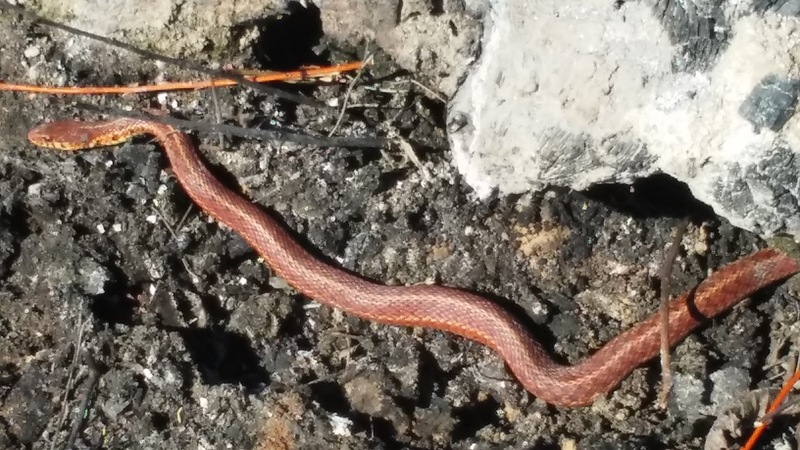 For a second time, I saw a snake and did not scream. 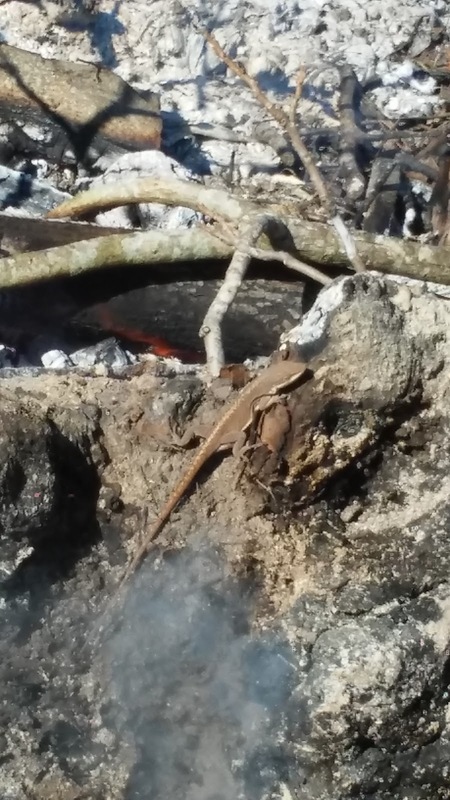 This fellow was on the warm ashes beside the fire. I thought he was too close. I prodded him, and he slithered under the big stump we've been trying to burn up for over a year. I rolled the stump over into the fire, and there he was, curled up. The stump was smoking, and I wondered if he was dead. I prodded him again. And I'm sorry to say, he slithered into the fire. It was shocking! As his head neared the very hot embers, he tried to recoil, but it was too late. His head was singed. He died and I carried him away. Later I saw a lizard on that same stump! I didn't mess with him at all. Our tree-chipping friends delivered yet another pile of mulch. For free!! Yay!! Adam gets to haul and haul and haul ... again! 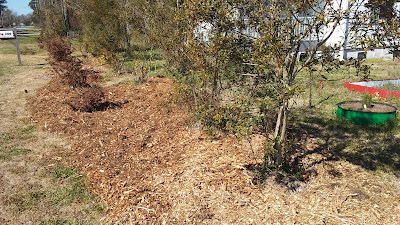 Now that he's mulched to his heart's content in the veggie patch, this new mulch went over the shrubs along the road front. Adam has taken to calling our vegetable garden, the "patch," as the British do. He's so silly. 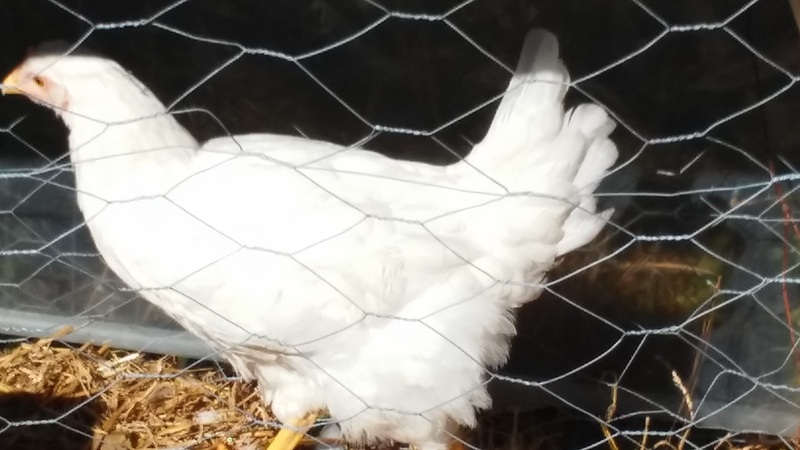 Here's my new chicken, Snow. She's still in isolation, although her private pen is inside the other chickens' yard, so they are around each other. Next week I plan to put them together under close supervision. She has grown a lot. Here's her face. 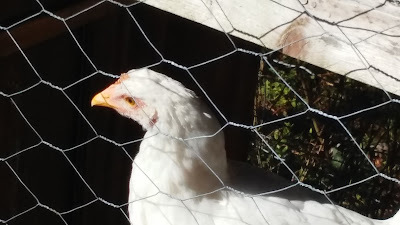 I've read that hens with white earlobes lay white eggs, and hens with red earlobes lay brown eggs. Hers are small yet, but look like they might be pinky red. I'm wondering if she's actually a leghorn; there are other white breeds. We shall see! I'm wondering about my eucalyptus tree. All her leaves are copper brown after the winter. Is she alive? The leaves are quite pretty. I just hope there's new growth coming soon. And now! 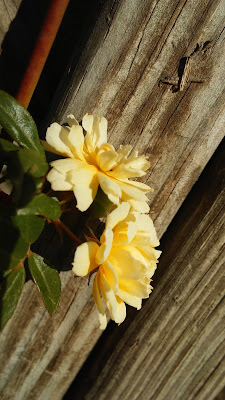 My Lady Banks Rose! Look at her! I'm so pleased and proud. She's blooming beautifully in this her first year. Here's my Baby. I finally got a close-up shot of her face. I can't tell you why, but she is just my dog. I know she adores me. Don't know why. She doesn't look like the kind of dog I might choose for myself. But there you have it -- we've picked each other. I just love her. 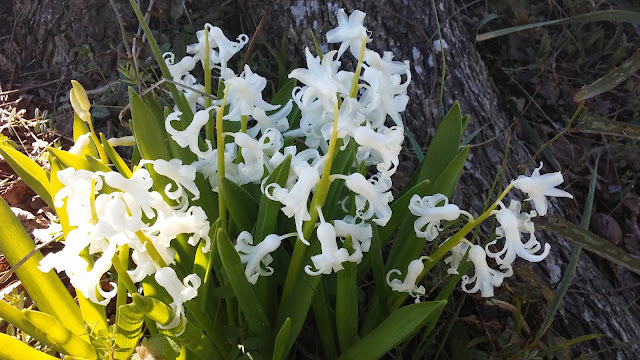 My white hyacinths are gorgeous too, yes? 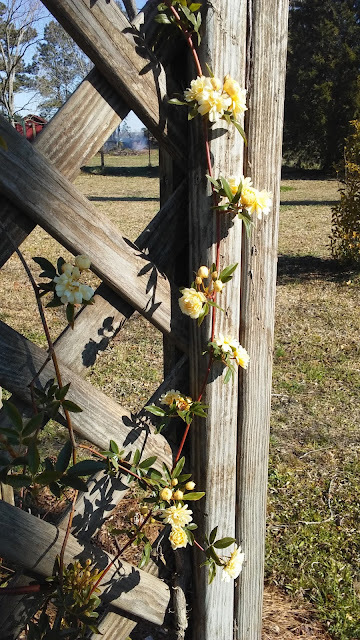 What's blooming in your yard, friend? Are you still in winter's grip? I think ... hopefully ... we are past our big chill this year. Good name for your new chicken. 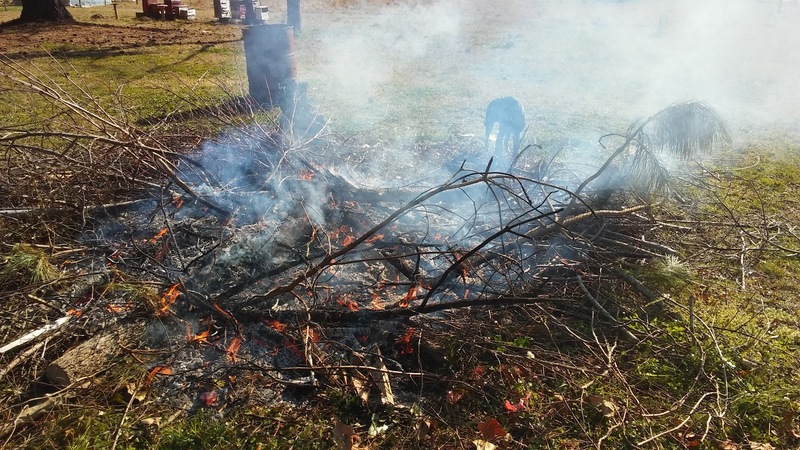 Surprising that the snake went into the fire!! What kind of snake was that? 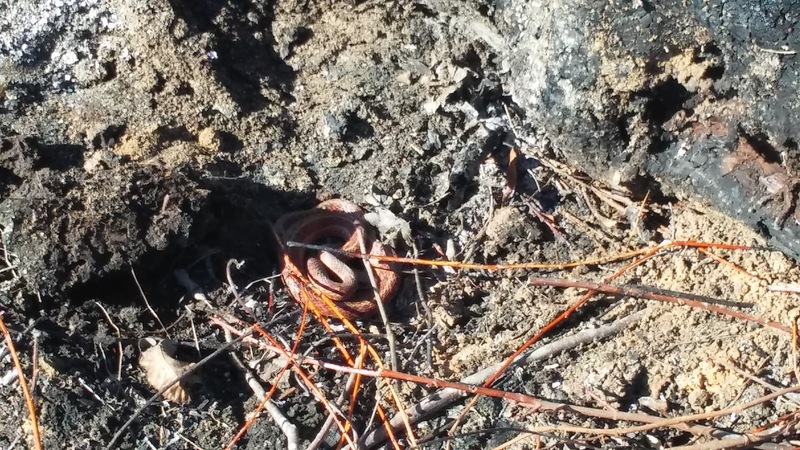 Not a copperhead I hope! 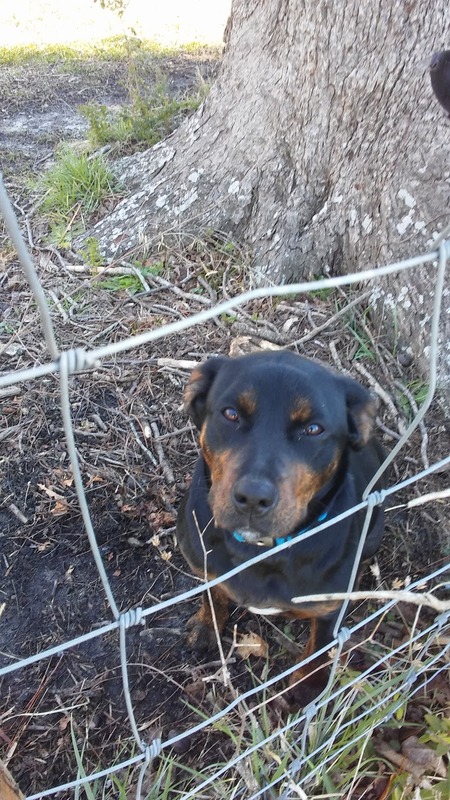 (He was kind of coppery colored...) Baby is a sweet looking dog. I don't know that snake either. What is it? 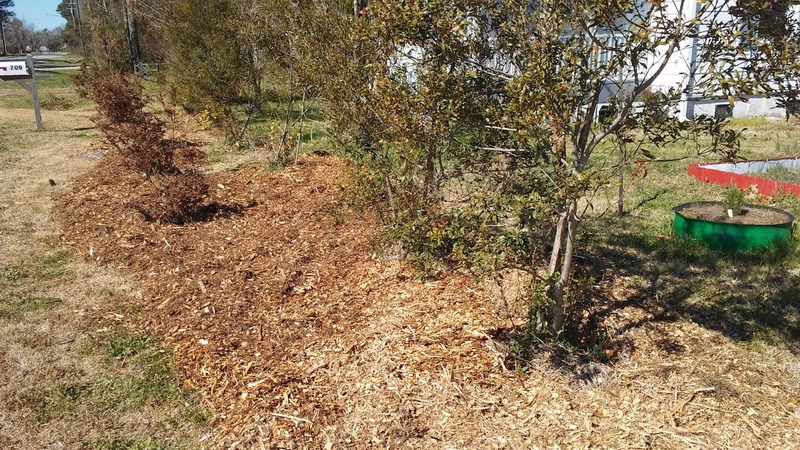 That mulch looks awesome. 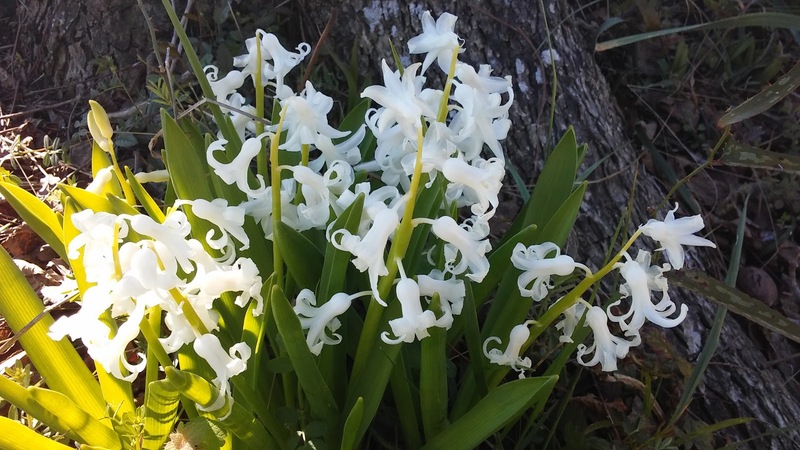 And so does your rose and the hyacinths. Aren't dog ears the very best? I love that softness. 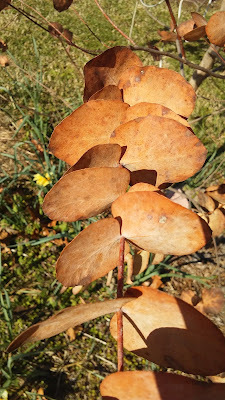 I hope you will let us know if the eucalyptus gets new growth. I've never seen one turn brown - I thought they were all evergreen. 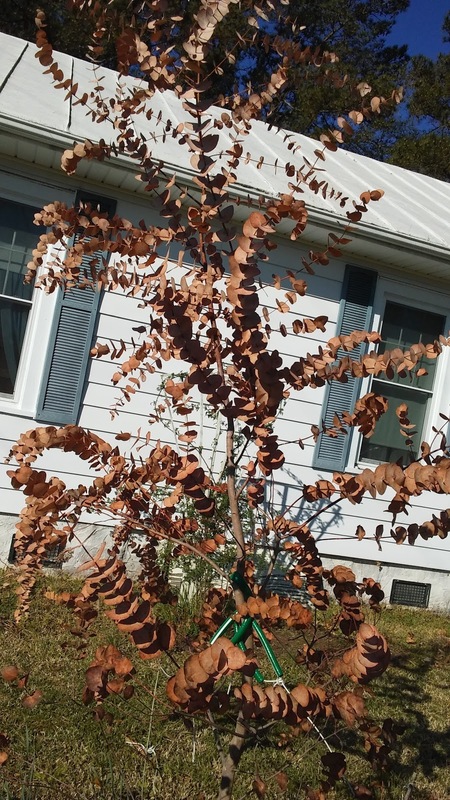 But after seeing yours, I looked around online and read about trees that die back and send out new growth in the spring. Interesting! Aw, your favorite pup is very sweet! Our patch is a good thing to call our garden. You guys are worker bees. Still freezing cold here after quite a mild start to March. I was nearly tempted to plant my geraniums last week, but I'm glad I didn't as tonight is supposed to be especially cold. 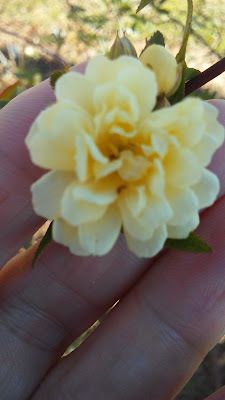 I love your roses and really envy you all that free mulch. 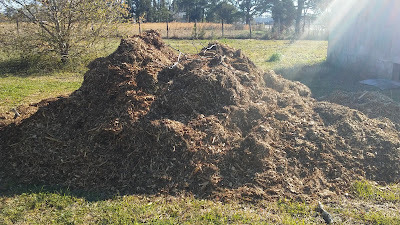 I make compost but only manage a smallish amount. I spread it somewhere different each year and it has definitely made a huge difference to the hard, grey clay that we inherited with this house.